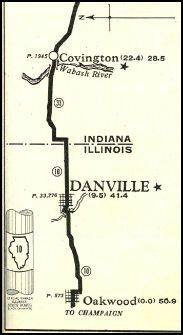 In the 'teens the highway followed a southern route through Newman and Tuscola, but by the early 20's it had been rerouted through Danville and Champaign-Urbana. Even after the "official" route change, the southern route was used and referred to as the PPOO Highway. Read a story of the highway near Newman from the Champaign-Urbana News Gazette here. Winchester to Hannibal, MO: note "future route" which was the US 36 alignment for decades, until 36 was routed to the north as part of I-72 around 2000. 1922 bridge sign on an abandoned highway segment west of Detroit, IL. 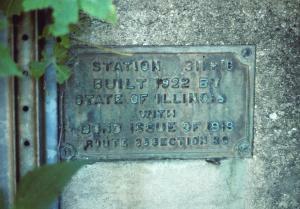 Note that the plaque references "Route 36" - a state route number until U.S. Highway 36 was laid out after the federal highway act of 1926 . A segment of the old PPOO route (now named "Ocean Trail") intersects with modern U.S. Highway 36 on the west side of Decatur. 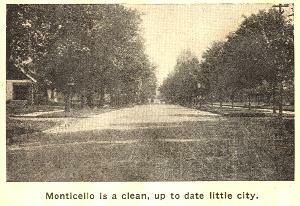 Junction West of Pittsfield, probably not long after the U.S routes began in 1926. U.S. 36 is on the middle sign but there are no U.S. route markers. Instead you see what appear to be privately installed adverising signs: e.g. "All concrete route", trying to lure the motorist along a preferred route. The sign pointing toward U.S. 24 also says "Kansas City" and "Direct Route", a dsitinct contradiction if you look at a map. Today, U.S. 54 goes left and Illinois 106 (former U.S. 36) is the right-hand route.